Need a fun, new, up to date bulletin board idea for the 100th day? Or, for your open house? Or the end of the year? 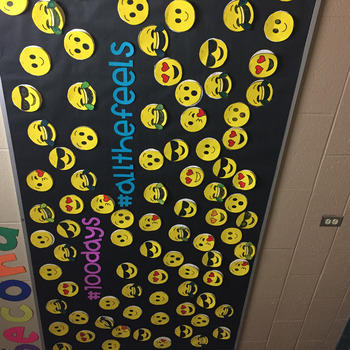 This bulletin board combines emojis and writing like you've never seen before. 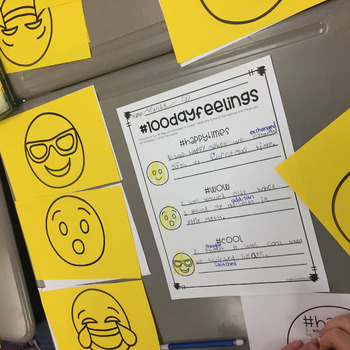 Students will write about 3-6 of their favorite things from the school year for particular emotions: happy, cool, funny, love, kindness, surprised/wow. 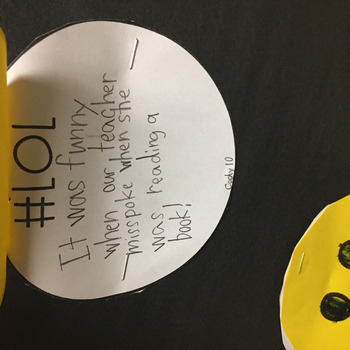 Then, it's up to you on how many you want your students to recopy. I had 24 students, so each student chose their favorite 4. (and I wrote 4 too). 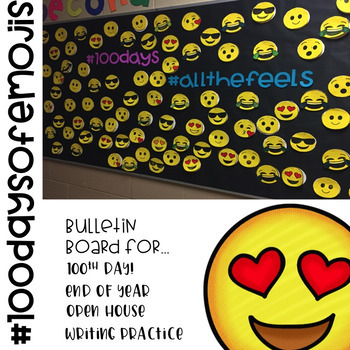 We have 100 emojis on our bulletin board for the 100th day of school...... and this display will be up for a LONG time! It will be great for parents to see at our Spring Open House too! Shhhh! I also took a writing grade from their sentences, all while they thought they were just completing another craft. I also included some fun hashtag headers for you to use as well, but you can also come up with your own! NEWLY ADDED: 120 heading and bulletin board letters for those schools/classes doing 120th day now instead of the 100th day!